The LA Times Babylon & Beyond blog reported on Sunday that Apple has reunified Jerusalem. Has Steve Jobs become a United Nations peacekeeper? Did Apple release a new app that unites the holy city of Jerusalem during these tense times? Maybe you thought Jerusalem had already been reunified several decades ago. Well, it turns out that even the weather in Jerusalem has been politicized. 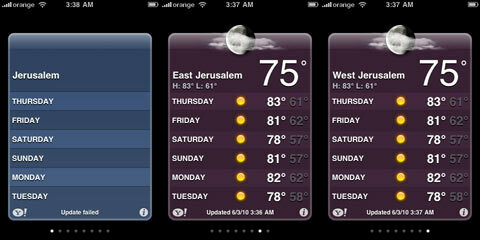 Yahoo, who runs the Apple iPhone Weather app with information gathered by Weather.com changed created two choices for viewing the weather in Jerusalem – East Jerusalem and West Jerusalem. This is different than the designations on Yahoo's own site and on the Weather.com site. Right-leaning Israeli politicians like to refer to Jerusalem as their "undivided capital." But iPhone users here and around the world found recently that the storied, disputed city had been split in two. In the smart phone's weather application, the listing for "Jerusalem" disappeared earlier this month and was replaced by "West Jerusalem" and "East Jerusalem." Both Israelis, who dominate the west part of the city, and Palestinians, the majority in the east, claim Jerusalem as their capital. Israel annexed East Jerusalem after the 1967 Middle East War, though Palestinians (and most of the international community) never accepted it. The debate over how, or whether, to divide Jerusalem is still one of the thorniest issues in Mideast peace talks. Perhaps frustrated with the lack of progress in the peace process, iPhone engineers apparently decided to impose their own mini-version of a two-state solution by partitioning the city and, in essence, forcing users to pick sides. A similar change took place on Yahoo's weather site, which gave users the option of checking the temperature in "Jerusalem, West Bank, Palestine" or "Jerusalem, Israel." Reaction was mixed. A few Israelis and Palestinians got a kick out of the option, even though temperature information and other data were identical for East and West Jerusalem. But many Israelis, here and in the U.S., took deep offense and accused Apple, the company that makes the iPhone, of "political propaganda." One Jewish advocacy group, American Israeli Action Coalition, called the changes "extremely hurtful to the American Israeli community" and said they "smack of anti-Semitism." Israel's U.S. ambassador reportedly sent a letter of protest to Apple chief Steve Jobs and Yahoo chief Carol Bartz. Well, it turns out that both Apple and Yahoo reversed their political decision and reunified Jerusalem. The following statement was released: "The issue for the iPhone Weather app has been fully resolved. The fix was pushed to all production servers and verified…. 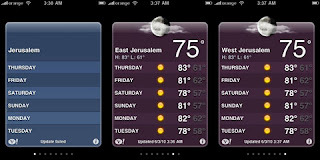 This resolves both the issue with the default weather location Jerusalem as well as searches for “Jerusalem”, “East Jerusalem” and “West Jerusalem". One note: Users who have already added the locations “West Jerusalem” or “East Jerusalem” on the Weather app will continue to see these names on the client until they remove these locations and add Jerusalem again." Especially scary is that it shows temps in the 80s in Jerusalem, when they use the metric system. That's like 175 degrees Fahrenheit!